Main may be too much an ideologue to be an effective commissioner. Time for a little mea culpa. Eight years ago, of the two choices available, I considered Bob Main the most likely candidate to represent the populist view. The county’s assessor at the time, I even felt Main might be slightly more reasonable when it came to exploitation of the environment. Of course, he was running against incumbent Commissioner John Griffith and only the CEO’s of BP Oil and Massey Coal might have shown more disregard for the environment in favor of unlimited resource extraction than Griffith. Since then Main has methodically, painstakingly and consistently worked to prove me wrong on so many levels. 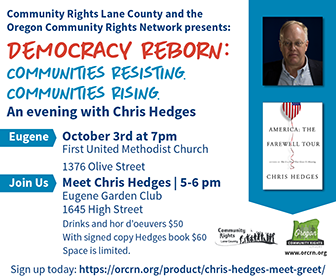 He is no ally to the environment, (he even came out as a climate change denier), and rarely misses and opportunity to deride anyone who might favor the Northwest Forest Plan over the Oregon Forest Practices Act, sometimes labeling them “radicals” at public meetings. Even those who might agree with Main’s views on climate and forest practices and environmental activism will have to admit that during his tenure the county has steadily gotten poorer and poorer. By his own admission Coos County is now facing a $2.5 million shortfall. Naturally, he blames the environmentalists or the federal government or the state for limiting logging and complying with NEPA (National Environmental Policy Act) and generally placing the long term health of the environment above the near term needs of the county’s treasury. It is important to note, however, that the commission has had almost two decades to wean off timber and become sustainable yet Main’s only solution to the county’s fiscal shortfall is to join in lawsuits against the state and federal government to increase logging. These questions could be asked of all three commissioners but why, exactly, is Bob Main running again except to maintain the status quo and a steady decline in funding? What has he accomplished that convinces him or us the county needs him for another four years? In light of the recent occupation of the Malheur Wildlife Refuge and the anti-government occupiers’ alignment with with the same groups behind the 2nd Amendment Preservation Ordinance here in Coos County it is important to ask another question. Is Bob Main a radical? As someone who believes in democracy so much that I am a chief petitioner on both a local and statewide citizen initiative that challenges federal authority over local decision making I am natively sympathetic to citizens standing up against state or federal overreach. However, the ordinance passed in Coos County last November has some troubling features. My primary objection to the ordinance as written is that after democratically reaffirming the 2nd Amendment right to bear arms and asserting the intention to defy state authority the ordinance inexplicably, in the same document, effectively cedes all authority to one elected official, the county sheriff. It is like using democracy to establish a monarchy. One need only look to recent events in Harney County and the contrast between Sheriff Dave Ward and Grant County Sheriff Glenn Palmer to see the folly of this approach. Ward did not sympathize with the occupiers whereas Palmer did and may face a DOJ investigation for putting fellow law enforcement at risk. Why would citizens want to give any one individual so much undemocratic authority? The answer comes out of the Oregon occupation. It turns out the Malheur occupiers believe in something called county supremacy. This is the belief that the county sheriff is the highest law enforcement authority and that the American people, through the federal government, have no right to public lands. The Coos County ordinance was identical to an ordinance passed in Wheeler County and was drafted with the assistance of the Oregon Firearms Federation (OFF). OFF along with the Constitutional Sheriffs and Police Officers Association, Oath Keepers and the other anti-government groups sympathetic to the refuge occupiers all ascribe to this concept of county supremacy. Interestingly, news media referred to the occupiers as “militants” or “militia”, “far-right extremists”, “fringey”, ( so glad to learn that is a word), “wackos” and, of course, “radical”, “very radical”, “ultra radical” and “extreme radicals”. Main, for those who don’t already know was a big supporter of this fringey, extremely radical ordinance, so much so he actively collected signatures to help put it on the ballot. The ordinance has since been much maligned in the news both locally and nationally and it brings to mind a lot of questions. The first question I asked Main was had he actually read the ordinance… he didn’t answer. Assuming he did read it then he must hold the same radical views as the authors of the ordinance. If he didn’t read it, well, that is even worse. Out of a possible 33,000 just 9,000 citizens or just 27% of registered voters checked the yes box but he doesn’t see his involvement as anything that might offend the majority of voters in May’s election. Last summer Main, cunningly disguised as a county commissioner, joined a group of us having coffee at a Coquille diner and asked if we would sign his petition. Since I am collecting signatures to put an initiative on the ballot as well I said that I would sign his if he would sign mine. He balked reminding me how The World newspaper had beaten on him for signing the home rule charter effort a couple years before and even though the Coos County Right to a Sustainable Energy Future is not a charter, he said he didn’t dare risk criticism. Fair enough, but he is such an ideologue that it didn’t occur to him that actively collecting signatures for the 2nd Amendment initiative might also be viewed with dismay and alarm by Coos County voters. The deadline to file for the May election is coming up fast, March 8. In my view, particularly after the events in Eastern Oregon and coupled with his mediocre record over the last eight years, Main is vulnerable at the polls. Regrettably, the only challenger so far aligns with the same extremist views and won’t win anyway. Now would be the time for someone less on the fringe, preferably liberal leaning, (since we liberals are underrepresented on the board), and who is focused upon sustainability to take a shot at serving Coos County.